Happy Monday (said no one ever)! I hope you took advantage of the weekend and slept in, ate too much, and hung out with your favs. I know I did! But, it's Monday now, time to get to business and check out my updates and goals for this week. My sessions this week were 539. I did jump back up some from last week, but I didn't come close to meeting my goal. I really underestimated the highs of that post that went viral, and I definitely overestimated the return traffic I'd get from it. However, I ain't mad at my stats and I'll tell you why. My bounce rate is damn good for a blog. For an average, everyday business site, the bounce rate should be under 50%, but blogs see closer to 70-80% bounce rates. 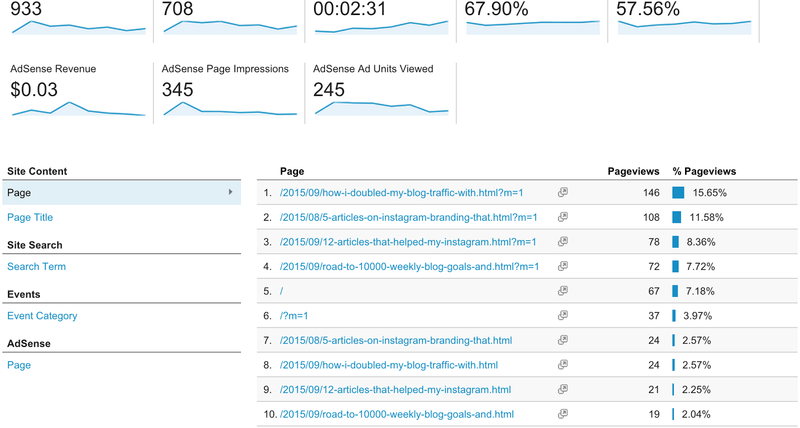 Although, my traffic isn't massive by any means, whatsoever, the traffic I do get is engaged. Also, take a look at the new visitor versus returning visitor. I am getting 34% of my visitors to come back. That is a positive too. Not too many one and dones. Maybe I'm looking for light in the darkness of not meeting my goal, but, whatever, I still see light. My very favorite referrer was my top again - Pinterest! I'm really working on building my Pinterest presence. In fact, on Wednesday, I'll be posting a Pinterest challenge that anyone can join! I am working on building a strategy based on my analytics (from this post on using Google & social analytics to double my blog traffic). Basically, you'll get a guidebook and join a private Facebook group with me and we'll be keeping each other accountable to build our Pinterest accounts using these strategies. I'm thinking of calling it The Great Pinterest Experiment! Email me if you want to get in the challenge group early. I beat my goal! I got four new sign ups this week for the course AND I finished it. It's going to be good. There are three modules: Researching Your Audience; Branding Your Instagram; and Growing Your Followers. It comes with a master workbook and then each section has its own worksheets/study guides, homework assignments, video tutorials, and presentation. There's also a Facebook group, so we can chat. It goes live October 1, and I am super excited to work with my new students and hear about their progress. 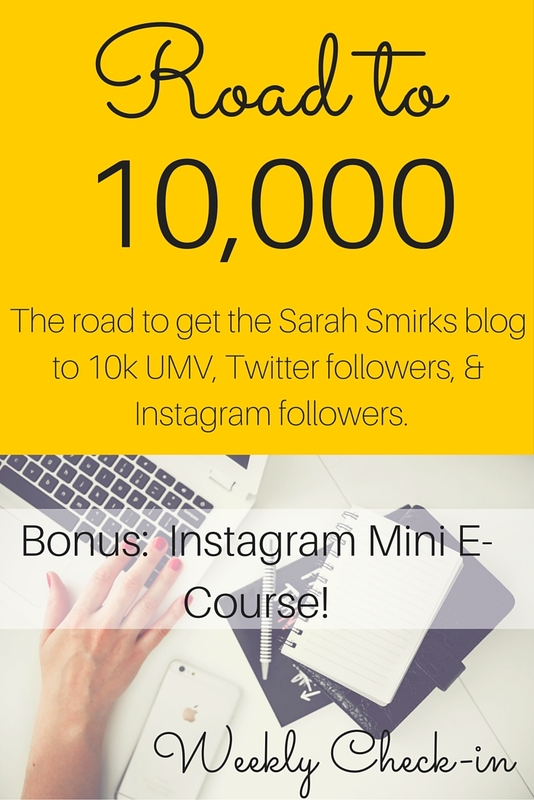 You can learn more about the Instagram mini e-course here. Status: #Fail, but there's a reason. I have been working with tech support on an issue. The reason I didn't grow much is because my app isn't working! I'm not able to follow or unfollow anyone right now. I'm also not getting alerts when people are following, liking, or commenting on my pictures. It just freezes. I haven't gotten a resolution on that yet, but, in progress. I am going to stick with my posting schedule of Monday, Wednesday, Friday and promotion on Tuesdays and Thursdays. This weekend, I did not promote, which I should have, so I will try and remember to do that this coming weekend. I haven't done a Twitter chat in a couple weeks. I have just been exhausted by the time they roll around. Yes, they're generally at 7 or 8pm, judge away.. I deserve it. I'm going to try and do one of these three: blog boost chat, elle chat, nectar chat. We'll see! I am fully confident that the content that I have put together for this e-course will help my students Instagram accounts blow up. I'm going to begin promoting it more. Maybe a Facebook or Twitter ad? Opinions? By the way, I still have two coupon codes available for bloggers who would be interested in taking the e-course for $1 (normally $17) in exchange for a review on your blog. If you're interested, contact me here with your information and a media kit, if available. Alright, my lovelies, that's all for now. How were your goals this week? By the way, you can follow along with me on Bloglovin here!